Dermal fillers are substances that can be safely injected into or under your skin in order to restore smooth texture and youthful shape. Dermal filler also contours of your face, lips, hands, or other area of the body which appearance needs to be rejuvenated. Examples of dermal fillers are Radiesse® and Juvederm®. 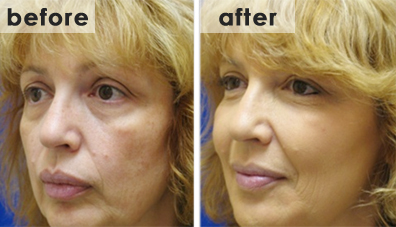 Dermal Fillers fill defects, deep wrinkles and depressed scars, and to re-create facial contours lost with aging. By them-selves, or combined with other techniques such as Botox or laser treatments, fillers can be used to make you look years younger without the risks and discomforts of surgery. The filler plumps up the area where it is injected. Because fillers are a natural substances, your body gradually metabolizes them. Fillers also stimulate collagen production in your skin, giving you a longer lasting effect. Thus, any treatment with the above fillers isn’t permanent, but lasts 6 months to 2 years, depending on the filler and the treatment. Dr. Pinkhasik uses a very fine needle to place fillers in key regions of your face where loss of volume has created changes, resulting in an aged and tired appearance. Corners of the mouth: also called the oral commissure, if these are turned downward it can make you look as though you’re sad or angry. Jowl: the area on either side of the chin, where skin can sag due to loss of facial volume. Tear Troughs: the area below you eye that create “bags and hollows under the eyes”. We have seen amazing results in men and women with the placement of Radiesse, Juverderm and other fillers. This treatment will instantly take years off your face. Here, a soft tissue filler had been injected into naso-labial folds and into lips, restoring volume lost due to aging, and resulting in a smoother, rejuvenated appearance. 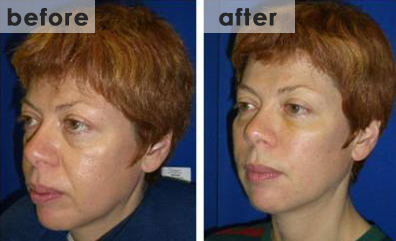 Here, Radiesse was injected into Zygomatic (cheekbone) areas, Maxillary areas (under eyes), Naso-labial folds, Marionette lines (at corners of mouth), and chin. Total 4 syringes of filler material were used. Here also Radiesse was injected in Zygomatic (cheekbone) areas, Maxillary areas (under eyes), Naso-labial folds, Marionette lines (at corners of mouth), and chin; 8 Syringes in total. Naso-labial folds injected with Hydroiodic acid. Are there any pre or post care instructions for Dermal Fillers? Yes, there are pre and post care instructions that we like all our clients to follow. How soon will I see results with Dermal Filler, and how long will they last? Immediately upon injection, Dermal Filler restores volume to smooth out the signs of aging. The natural-looking results may last up to a year or more in many patients depending on the filler used and your body’s response. The skin is numbed just before injection, and lidocaine (local anesthetic) is mixed with the fillers, so the pain sensation is blocked. You may feel some temporary pressure or fullness in the area injected with fillers. This makes the procedure much more comfortable. Come and visit our clinic for Dermal Fillers.